Amy Smith smiled as her 13-year-old son Sam raced down the field, holding tight to the football. He seemed to glow as he ran, his whole being immersed in his favorite sport. It was October 2011, at Summit Lakes Middle School, and Amy stood in the bleachers, along with the other cheering parents. Then, just as Sam achieved a first-down, three other players hurled themselves onto him and they all crashed down. Amy took a deep breath. This was just part of the game and though she wanted to go to him, she knew the coach’s rules: “No parents are allowed on the field or the sidelines.” So she waited for Sam to dust himself off and resume playing. He always grinned when he got up, even after such a fierce tackle. He didn’t bounce up like he usually did. Amy bit her lip as her son finally pushed himself to sitting. But he couldn’t stand by himself. His teammates helped him to the bench and ignoring the rules, Amy ran to her child. Sam was in pain, crying, and he told his mom, “I heard something break.” They rushed him to the emergency room, got a cast on the broken leg, and were told to follow through with an orthopedic surgeon. They figured it was all part of the protocol, part of the risks of playing football. Back at school, Sam, didn’t let his injury deter him. Soon his cast was decorated with brightly colored signatures and well wishes from dozens of friends. He sailed around school on crutches and cheered on his teammates from the sidelines. The Smith family was back to normal. Amy was studying to be a nurse. Her husband, Tony, worked as an attorney. Sam’s two older brothers and his younger sister were all happy, healthy, and involved in school and extracurricular activities. Over the next months, Sam doggedly went to physical therapy but didn’t seem to be improving. He kept his positive spirits, but he was frustrated that he didn’t get to play his beloved sports. In January 2012, when the doctor wanted to do a bone biopsy, Amy pressed down her worries, not wanting to alarm Sam. “Our family has a deep faith and we drew on that faith,” Amy says. They had to draw deeper. Right after the biopsy, when Sam was still in recovery, their doctor beckoned to Amy and Tony. They crammed into a small windowless room to talk to the surgeon and an oncologist. Amy’s heart was thundering as the doctors starting talking about treatments. The biopsy results were not back, but the physicians were sure Sam had osteosarcoma, bone cancer. Her mouth went dry and she felt faint. Then she drew back her shoulders and prepared to go to her son, who was just waking up from the surgery. How do you tell your son he has cancer? This impossible task loomed large in Amy’s mind as they drove Sam home. They settled Sam in his bedroom and Amy took his hand. “The oncologist was there,” she told him. Sam kept his positive outlook during his grueling new routine: go to chemotherapy on Thursday and Friday, feel wretchedly sick on Saturday and Sunday, and attend school on Monday through Wednesday. During the next years, Sam bravely faced a series of daunting physical challenges. He had surgery, taking out the cancerous bone and he received a titanium replacement. He endured multiple rounds of chemotherapy treatments. 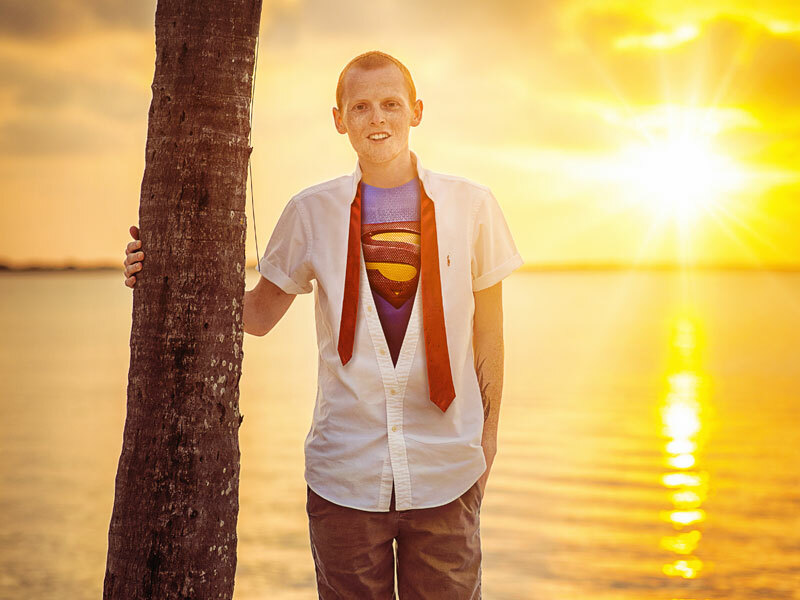 Throughout all the pain and turmoil, Sam kept his spirits high, tried to keep his body strong by swimming laps, and stayed connected with his teammates, his schoolwork, his friends, his faith and his love of football. He gave inspirational speeches at the high school, sharing some of what he was going through. He tackled every obstacle with grace and persistence and graduated high school in May 2016 with plans to go to college. After school, he dreamed of attending law school, then going into sports management. But right after graduation, the cancer invaded his lungs. He endured surgery, then a drug trial. But the tumors marched forward. College and dreams of the future would have to wait. As the family searched for answers, tragedy struck anew. On August 6, 2016, Sam’s father had a heart attack and died. The family was devastated, especially Sam. His dad was his rock, always in his corner, always there for Sam. He couldn’t imagine being without his father. But he had to put his grief on hold in a fight for his life. Shortly before Thanksgiving, with Sam in and out of the hospital, Amy received a call from Chief Elf, the leader of the Elves of Christmas Present. “A friend told me about Sam,” the Chief said. His voice was soothing as he asked Amy about Sam and her other children. He asked about Sam’s interests, and his favorite things and about his chemo schedule. Amy told him about his passion for sports, his love of the Kansas City Chiefs, his favorite player Tyreek Hill. Amy felt a sense of calm and support, just talking to the Chief. That would be the first of many calls. The Chief asked her off-the-wall questions, inquiring about Sam’s energy level, how he did in cold weather, and his career hopes. The Chief was always a little secretive and Amy didn’t know what he had in mind for Sam. Still, she found herself feeling a momentary excitement. On Christmas Eve, Sam was in the hospital for overnight observation. Two men laden with gift bags and packages showed up in Sam’s rooms. “We are the Elves of Christmas Present, with gifts for Sam,” they said. Sam began tearing open the packages. The Elves surprised him with tickets to the Chief’s Christmas game for his whole family, including a tailgate party, phenomenal seats, and even field passes. Sam was invited to meet the team and have a personal meeting with Tyreek Hill. Sam grinned under his new Chief’s cap and reveled in his signed Tyreek Hill gloves and a dazzling assortment of Chief’s items. But there was one last gift. One of the elves handed an envelope to Sam. It was a letter from Tom Condon, regarded as the most powerful agent in the NFL. Condon represented more than 75 current NFL players, including Peyton Manning, Eli Manning, Marvin Harrison, Simeon Rice, and LaDainian Tomlinson. “If you ever want to talk, if you ever have questions, please do call me,” Condon said. Be strong, Sam, I know already you are: YOU ARE MY MVP. Tom Condon, THE Tom Condon was offering to be his friend and advisor. He felt so encouraged and supported that this important man cared about him and wanted to help him. “Feeling blessed beyond belief,” he wrote, later that night. Not all stories end the way we wish. On Easter Day, 2017, Sam told his mother, “I can give up now. I don’t have to keep fighting.” He died, with friends and family beside him. Though Sam Smith had a short life, he made a large impact on his friends and in his community. “He inspired so many people,” Amy says. Sam was constantly aware of the many blessings he experienced during his illness. He grew in his faith and enjoyed deeper relationship with friends and family. He always said “I Love You,” when he left any one: he never took living for granted. And he lived to fullest, embracing friends, events, and family time.